This article is about the plant genus. For other uses, see Verbena (disambiguation). “Vervain” redirects here. For other uses, see Vervain (disambiguation). Verbena (/vərˈbiːnə/, vervain) is a genus in the family Verbenaceae. It contains about 250 species of annual and perennial herbaceous or semi-woody flowering plants. The majority of the species are native to the Americas and Asia. The leaves are usually opposite, simple, and in many species hairy, often densely so. The flowers are small, with five petals, and borne in dense spikes. Typically some shade of blue, they may also be white, pink, or purple, especially in cultivars. The genus can be divided into a diploid North American and a polyploid South American lineage, both with a base chromosome number of seven. The European species is derived from the North American lineage. It seems that verbena as well as the related mock vervains (Glandularia) evolved from the assemblage provisionally treated under the genus name Junellia; both other genera were usually included in the Verbenaceae until the 1990s. Intergeneric chloroplast gene transfer by an undetermined mechanism – though probably not hybridization – has occurred at least twice from vervains to Glandularia, between the ancestors of the present-day South American lineages and once more recently, between V. orcuttiana or V. hastata and G. bipinnatifida. In addition, several species of verbena are of natural hybrid origin; the well-known garden vervain has an entirely muddy history. The relationships of this close-knit group are therefore hard to resolve with standard methods of computational phylogenetics. 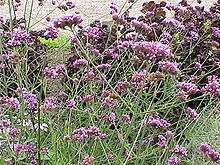 Some species, hybrids and cultivars of verbena are used as ornamental plants. They are drought-resistant, tolerating full to partial sun, and enjoy well-drained, average soils. Plants are usually grown from seed. Some species and hybrids are not hardy and are treated as half-hardy annuals in bedding schemes. They are valued in butterfly gardening in suitable climates, attracting Lepidoptera such as the Hummingbird hawk-moth, Chocolate albatross, or the Pipevine swallowtail, and also hummingbirds, especially V. officinalis, which is also grown as a honey plant. The hybrid cultivars “Silver Anne” and “Sissinghurst“ have gained the Royal Horticultural Society‘s Award of Garden Merit. For some verbena pathogens, see List of verbena diseases. Cultivated verbenas are sometimes parasitized by Sweet potato whitefly (Bemisia tabaci) and spread this pest to other crops. 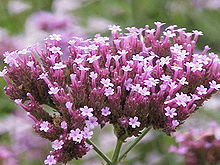 The essential oil of various species, mainly common vervain, is traded as “Spanish verbena oil”. Considered inferior to oil of lemon verbena (Aloysia triphylla) in perfumery, it is of some commercial importance for herbalism. Verbena has long been associated with divine and other supernatural forces. It was called “tears of Isis” in ancient Egypt, and later called “Hera’s tears”. In ancient Greece it was dedicated to Eos Erigineia. In the early Christian era, folk legend stated that V. officinalis was used to staunch Jesus’ wounds after his removal from the cross. It was consequently called “holy herb” or (e.g. in Wales) “Devil’s bane”. Vervain flowers are engraved on cimaruta, Italian anti-stregheria charms. In the 1870 The History and Practice of Magic by “Paul Christian” (Jean-Baptiste Pitois) it is employed in the preparation of a mandragora charm. The book also describes its antiseptic capabilities (p. 336), and use as a protection against spells (pp. 339, 414). 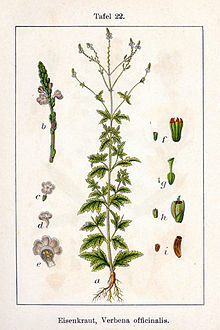 While common vervain is not native to North America, it has been introduced there and for example the Pawnee have adopted it as an entheogen enhancer and in oneiromancy (dream divination), much as Calea zacatechichi is used in Mexico. The common names of verbena in many Central and Eastern European languages often associate it with iron. These include for example the Dutch IJzerhard (“iron-hard”), Danish Læge-Jernurt (“medical ironwort”), German Echtes Eisenkraut (“true ironherb”), Slovak Železník lekársky (“medical ironherb”), and Hungarian vasfű (“iron grass”). An indeterminate vervain[verification needed] is among the plants on the eighth panel of the New World Tapestry (Expedition to Cape Cod). In the Victorian language of flowers, verbena held the dual meaning of enchantment and sensibility. Verbena has the following subtaxa. See also Aloysia, Glandularia and Junellia for species formerly placed here. ^ a b “Genus: Verbena L.” Germplasm Resources Information Network. United States Department of Agriculture. 2004-01-29. Retrieved 2011-08-29. ^ a b “GRIN Species Records of Verbena“. Germplasm Resources Information Network. United States Department of Agriculture. Retrieved 2011-08-29. ^ S. M. Botta, S. Martinez & M. E. Mulguta de Romero (1995). “Novedades nomenclaturales en Verbenaceae” [Nomenclatural revisions in Verbenaceae]. Hickenia. 2: 127–128. ^ Yao-Wu Yuan & Richard G. Olmstead (2008). “A species-level phylogenetic study of the Verbena complex (Verbenaceae) indicates two independent intergeneric chloroplast transfers”. Molecular Phylogenetics and Evolution. 48 (1): 23–33. doi:10.1016/j.ympev.2008.04.004. PMID 18495498. ^ “RHS Plant Selector Verbena ‘Silver Anne’ (G) AGM / RHS Gardening”. Apps.rhs.org.uk. Retrieved 2013-05-06. ^ “RHS Plant Selector Verbena ‘Sissinghurst’ (G) AGM / RHS Gardening”. Apps.rhs.org.uk. Retrieved 2013-05-06. ^ a b “Vervain”. Drugs.com. 2009. Retrieved 7 March 2018. ^ “Flower remedies”. Cancer Research UK. Retrieved 11 November 2016. ^ Pitois, Christian (1952). The History and Practice of Magic, Volume 2, Forge Press. p. 402. ^ Quattrocchi, Umberto (2000). CRC World Dictionary of Plant Names. 4 R-Z. Taylor & Francis US. p. 2787. ISBN 978-0-8493-2678-3. ^ Gledhill, D. (2008). The Names of Plants (4 ed.). Cambridge University Press. p. 399. ISBN 978-0-521-86645-3. ^ “Language of Flowers – Flower Meanings, Flower Sentiments”. www.languageofflowers.com. Retrieved 2016-11-26. ^ “Verbena” (HTML). NCBI taxonomy. Bethesda, MD: National Center for Biotechnology Information. Retrieved 21 June 2018.